After living in CT last year I have found a love for this place like no other, not only does it have spectacular views but the lifestyle here is just too amazing! I am very blessed to have met some amazing people and also be able to come back to this great city frequently. Each time I am here I discover new places and space which make me fall more in love with Cape Town, and also because my favourite lump of rock (Table Mountain) is here too, standing tall above everything. This time I am in Stellenbosch visiting a dear friend Jandre and also seeing my family from Dubai for my cousin, Josh’s 21st birthday! Yesterday after a slow start to the day we set off for breakfast and then later I was taken on a guided tour of the wine farms and little towns surrounding Stellenbosch. 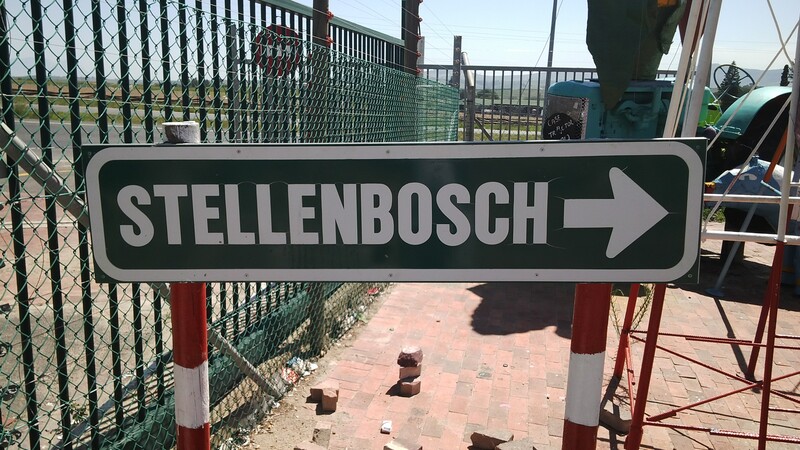 Stellenbosch has a little country side charm that is not only endearing but also beautiful landscapes of vineyards leading up to a backdrop of the mountain range surrounding the area. Last stop for the day was the beautiful town of Franschhoek where we again were spoilt but the serenity of this quaint little town. We stopped off at La Motte Estate hoping to get a little something to eat but didn’t realise that we had completely lost track of time, lol. They have perfectly manicured gardens and the restaurant has these stunning chandeliers made from the crockery that was found at the farm from the founders of the estate, how awesome are they? To end off an absolutely wonderful day we took a walk through Franschhoek to the stop off and see the Huguenot Monument. One of South Africa’s moments in history which I was yet to see. I must just brag a little but all the pictures that I took were on the new BlackBerry Z10 and I am completely amazed at the quality of the pics it took! I being the avid ‘photographer’ love taking pics everywhere I go and there is nothing better than having a phone that takes such great pics! I must admit although I am a city boy and love the noise and vibrant atmosphere it has, but a place like Stellenbosch and that surrounds it really makes one think about living a simpler life. Thank you to Jandre for showing me his little peace of heaven and home which is Stellenbosch it has been a truly experience! Being content in my space.